OUT (6): Conor Lemirande (graduated), Kiefer Sherwood (turned pro), Carson Meyer (transferred), Austin Alger, Alex Alger, Willie Knierim. IN (5): Jonathan Gruden, Noah Jordan, Monte Graham, Brian Hawkinson, Scott Corbett. RETURNING (10): Srs. – Josh Melnick, Ryan Siroky, Zach Lavalle; Jrs. – Gordie Green, Karch Bachman, Carter Johnson; Sos. – Casey Gilling, Ben Lown, Phil Knies, Christian Mohs. NOTES: Gordie Green hit his stride midway through his freshman year and has gotten better seemingly every game since, as he led the team in goals (15) and points (33) as a sophomore. Newly-named captain Josh Melnick makes everyone around him better and finished with nine goals and a team best-tying 21 assists for 30 points in 2017-18. Phil Knies was last season’s freshman goals leader with 11, including six in a four-game road trip in January, he finished with 20 points, and fellow college rookie Casey Gilling added 19 and was one of the team’s best in the faceoff circle. Ben Lown (4-11-15) was the other significant contributing freshman up front. Speedster Karch Bachman nearly tripled his rookie points output, posting 16 points including seven goals after earning six as a freshman. The Florida Panthers draft pick netted three goals the final four games. Senior Ryan Siroky is the only other returning regular starter from last season. He dressed for 33 games and was of the team’s best hitters and played solid defense, contributing two goals and a pair of assists. Zach Lavalle, Carter Johnson and Christian Mohs logged a combined 46 games, and Johnson locked down a lineup spot the second half of the season with his energetic play. Not counting Johnson, that’s only seven every-night forwards back, meaning five other slots would be open each night. Even if all 10 veterans start that leaves two openings for newcomers. Of the freshmen, Jonathan Gruden is a near certainty to claim one of those lineup spots. Playing for the U.S. National Team the past two seasons, the Ottawa Senators’ fourth-round pick rolled up 34 points in 25 games vs. USHL competition last season as a 17-year-old while going plus-28. Monte Graham has serious NHL pedigree, as he is the cousin of Wild center Charlie Coyle and former NHL forward Tony Amonte. A New Englander, the former Boston College commit boast plenty of juniors experience, as he has played two full USHL seasons. Noah Jordan is 6-feet-5 and skated for North York in Ontario Juniors last season. He scored 18 goals in 2017-18, and the Toronto-area native led his team in playoff points. Brian Hawkinson has three seasons of USHL experience and is known for his grit and leadership. He was the captain for Tri-City in 2017-18, where he notched 16 points. 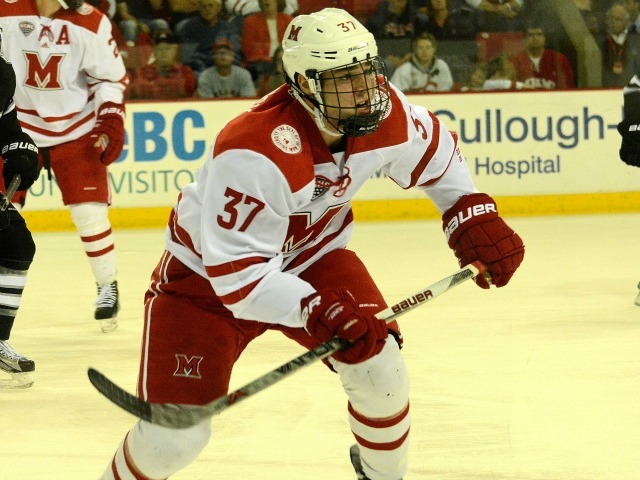 Scott Corbett is another Carmel, Ind., product, the same hometown as former defensemen Cameron Schilling and Grant Hutton. He is known as more of a playmaker and has good size at 6-1 and 187. 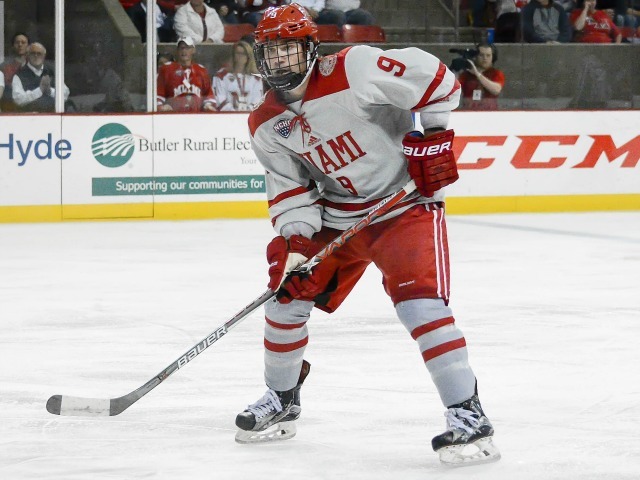 Though Miami was below average offensively last season, the RedHawks finished ninth in Division I on the power play (23.2 percent). Then again, MU’s defensive duo accounted for 13 of those 35 PPGs and managed just two markers in last season’s final 11 games on the man-advantage. Depth was an issue among centers and wings, as only eight forwards were able to generate seven or more points last season. “When we came here in the summer just to work on stuff, we actually started to get a lot better then,” Melnick said. Miami didn’t win on Saturday, but it did come back from three down to eke out a tie in its regular season finale. That was on the road vs. the fifth-ranked team in college hockey. After falling behind, 3-0 less than five minutes in, the RedHawks rallied for a 3-3 tie at No. 5 Denver on Saturday and earned the extra point in the NCHC standings with a 3-on-3 win. 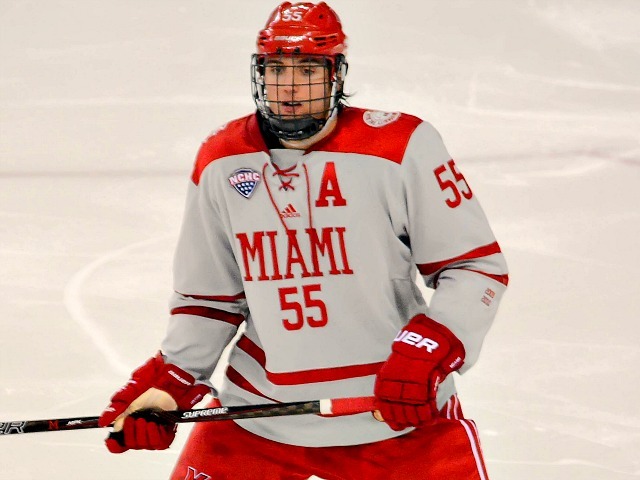 Despite earning seven conference points in its final four games, Miami finished last in the eight-team NCHC. The RedHawks enter the playoffs having won just two of its last 15 games (2-10-3). They will travel to No. 2 St. Cloud State next week to open the NCHC Tournament in a best-of-3 series. RECAP: Just 4:19 into the first period, Denver had already taken a 3-0 lead. Henrik Borgstrom centered one from behind the net to Jarid Lukosevicius in the slot for a one-timer 73 seconds into the game. Eighteen seconds later, Ryan Barrow went in alone and beat Miami goalie Ryan Larkin on the forehand. In another three minutes, Adam Plant found the net from the outside edge of the faceoff circle on a wrister through traffic. The RedHawks converted on a 2-on-0, with Gordie Green tapping home the centering feed by Kiefer Sherwood with 3:15 left in the first period as a Denver defender collided with goalie Tanner Jaillet. Jaillet finished the period but did not play the balance of the game. New Pioneers goalie Dayton Rasmussen was beaten on his first shot. After Zach LaValle won a battle along the boards, the puck found Karch Bachman, who skated in and fired one home from a bad angle. Bachman tipped home a blue-line shot by Louie Belpedio to tie it. In the 3-on-3 overtime, Phil Knies stole the puck and wired one home over Rasmussen’s shoulder. STATS: This was the 16th straight game in which the team that scored first also scored second. That means either Miami or its opponent has taken a 2-0 lead or more in every contest since Jan. 5. The odds of that happening at random are over 65,000 to 1. — The RedHawks snapped a seven-game streak without a power play goal, and they also scored in the first period for the first time in eight contests. Miami’s first-period goal total and its PPG total have been identical in nine straight games. — It was the first multi-goal game of Bachman’s career. The sophomore has already tripled his rookie goal-scoring input, as he has six markers this season vs. two in 2016-17. — Sherwood extended his team-best points streak to four games. He is 2-3-5 in that stretch and picked up a pair of assists in this contest. THOUGHTS: What a crazy ending. A Miami team that went 0-3-1 on a four-game road trip vs. Nebraska-Omaha and Colorado College and was 1-8-1 in its previous 10 contests broke even in its last four against North Dakota and Denver. Crazier is that the RedHawks’ opponents that took a 3-0 lead the past two weekends finished 0-1-1 in those games. Craziest: In Miami’s last 16 games, the team that has scored first has also netted the next goal. So RedHawks games have had a 2-0 score at some point in every contest since early January. These games were irrelevant to Miami from a seedings perspective, but a 1-1-2 record in its last four regular season contests vs. North Dakota and at Denver should at least inspire hope. — A big positive to take away from this game is Bachman’s scoring. He has been partly inaccurate, partly snakebitten while being placed on skill lines this season, and with his speed if he can start to find the net regularly his final two years could be very lucrative. LINEUP CHANGES: Just one: At forward, Carson Meyer was reinserted and Christian Mohs did not dress. It was just the second game Meyer has missed this season. FINAL THOUGHTS: These games were irrelevant in terms of the RedHawks’ place in the tournament world but had to give them momentum heading into the NCHCs. They hung with one of the top dogs in D-I for 125 minutes on the road. It’s the beauty of March: A poor regular season can be reversed with a conference tournament win. And desperation can be a strong weapon. St. Cloud State will play in the NCAAs, and any subsequent opponent in the NCHC field would likely be in that boat as well. There is no future beyond next weekend if Miami doesn’t win this series. Four years ago the RedHawks were in the same predicament and also faced St. Cloud in the first round. 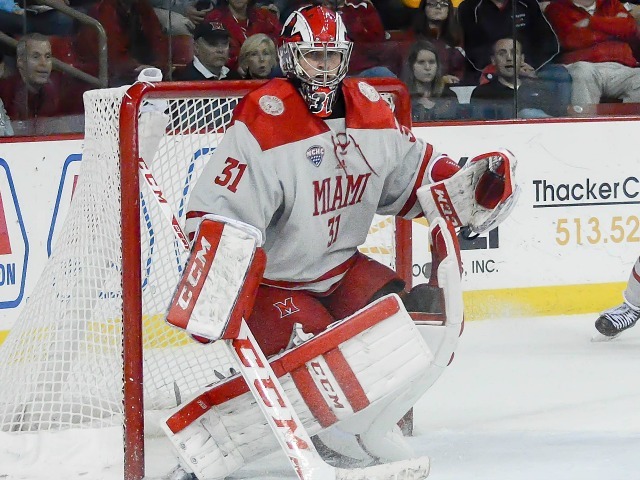 Miami won that series and ultimately fell a goal short in the NCHC championship game. 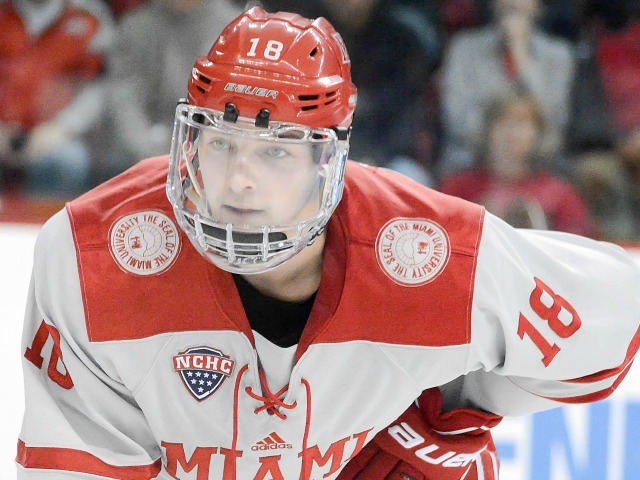 The odds of an NCAA berth for Miami are long, but a desperate RedHawks team again faces an elite SCSU team that will play on college hockey’s biggest stage regardless of this weekend’s outcome. After a scoreless first period that saw Miami outshoot North Dakota, 9-4, the Fighting Hawks clicked off three straight crucial goals in the middle stanza. That was more than enough offense for UND, which beat the RedHawks, 4-1 at Ralph Engelstad Arena on Friday. One of those early Fighting Hawks shots was a 5-on-3 slam-dunk one-timer that Miami goalie Ryan Larkin was somehow able to keep out of the net. But North Dakota (7-2-2) broke through seconds after a later RedHawks power play ended. Nick Jones, who had just been released from the penalty box, took an outlet pass and went in for a breakaway, skating around a sprawling Larkin for a tap-in goal four minutes into the second period. Rhett Gardner made it 2-0 when he skated behind the Miami net and tucked the puck inside the post on a wraparound with 3:43 left in that frame. Less than two minutes later, UND extended the lead to three when Jones located a loose puck at the top of the crease and banged it home. Karch Bachman got the RedHawks (4-5) on the board off a rebound when he poked a loose puck in the crease around a defender and into the net with 13:34 left in regulation. But the Fighting Hawks regained their three-goal lead with 8:34 left. Grant Mismash poked at a loose puck that was under Larkin, and it crossed the goal line to make it 4-1. Bachman’s goal was his second of the season, and both defensemen Grant Frederic and Alec Mahalak picked up their first assists of 2017-18. It was the first point of Mahalak’s career. Despite the final three-goal disparity, Miami outshot North Dakota, 28-26, thanks largely to a 9-4 advantage in the first period. The RedHawks have now logged 10 conference road games without a win, going 0-8-2 in that stretch. MU’s last away victory was at North Dakota in January. These teams will wrap up the weekend series at 8:07 p.m. on Saturday. OXFORD, Ohio – The third period was going so well for Miami. The RedHawks had tied the score at two and were pressuring the net for the go-ahead score. Then came the final seconds. Providence scored with 0.9 seconds remaining in regulation to edge Miami, 3-2 at Cady Arena on Saturday, extending the RedHawks’ winless streak to 12 games, their longest such drought in over a quarter century. So it’s time to take a step back and digest the results of this weekend series. It’s easy to pile on after the abysmal ending to the 2016-17 season. But some perspective. – Freshmen forwards stepped in right away and contributed. Austin Alger found the net in the opener and Casey Gilling scored in Game 2. Phil Knies is raw but impressed with his stickhandling. – Speaking of newcomers, Rourke Russell and Alex Mahalak, while raw, made a solid impression in the opening weekend. Russell agitated everyone he came in contact with, and Mahalak has an energy about him, and he will hopefully develop into a top shut-down D-man. – There was a lot to like in the third period, during which Miami controlled play. Well, maybe not in the closing seconds, but the RedHawks moved the puck very well and were in the Providence zone for a substantial portion of that stanza. – Karch Bachman was solid on the PK on Friday but barely touched the ice in the first period because he didn’t play during the extended penalty kill or ensuing five-minute power play. But he logged more minutes late and created multiple scoring chances. This guy needs to play more. – The team didn’t give up after falling behind multiple goals early. Had to appreciate the fight Miami displayed to get back into the game. – There hasn’t been that noticeable surge by any of the veterans that we’ve come accustomed to. That’s part of the fun of being a college hockey fan – watching the development of players on a year-to-year and weekend-to-weekend basis. Seeing so many freshman move into starting roles on a team that didn’t lose many players means a handful of starters from 2016-17 weren’t cutting it. – The major penalty by Carson Meyer was awful on his part. He had plenty of time to see the numbers on the back of the PC jersey and let off the gas but chose to bury the player. Providence agitated him before the opening draw, and 26 seconds later he’s done for the game and the Friars are on a five-minute power play, during which they scored twice. – Yeah, getting the game-winner scored on you in the final second is bad. Miami has a recent track record of losing games in painful ways late, so hopefully this ‘L’ doesn’t become a 2017-18 theme. The process is more important than wins and losses at this point of the season, but entering the season on a 10-game winless streak makes that college hockey axiom tougher to accept. Miami suffered through plenty of horror-show endings the past two seasons, and starting 2017-18 with one is tough. FORWARDS: D+. Not much offense was produced in the first two periods, and Miami finished with 20 shots, half of which came from the defense. Meyer’s penalty also works against this unit. Austin Alger wins the extremely-early rookie of the year race with his solid all-around play. DEFENSEMEN: B. Grant Hutton went 1-1-2 and Scott Dornbrock tallied an assist. This unit held Providence to 22 SOG, and Hutton and Louie Belpedio put four shots on net each. GOALTENDING: C. Similar game to Friday for Ryan Larkin. He made a couple of excellent saves but allowed goals on stoppable shots. LINEUP CHANGES: Grant Frederic was fine on Friday was sat on Saturday in favor of Chaz Switzer. The other 17 skaters plus Larkin were all the same. A week off and the return of two key players were not enough to lift Miami out of the doldrums. 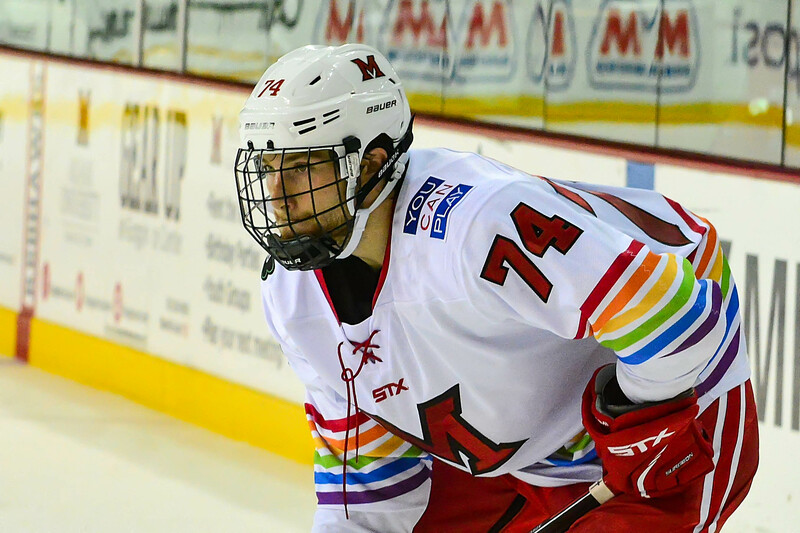 Despite a promising start that saw the RedHawks jump out to a two-goal lead, Cornell rallied to a 4-2 win over MU on Friday. That makes eight straight games without a win for Miami (3-7-4), its longest winless span in two decades. And in the third period, the RedHawks have allowed 14 goals during their slump. They’ve scored twice. Closing out games has been a residual theme for Miami over the past decade – since That Game That Will Not Be Mentioned, really – but right now this team is really in a third-period funk. The parity in college hockey is too great to give games away, and this is the second time during this skid that Miami has done just that. Flip those losses to wins – not a stretch considering MU led by two late in the second period of both games in question – and the RedHawks are 5-5-4. In the NCHC, one or two games over .500 is good enough for NCAA consideration, and Miami would be right there. Youth becomes less of an excuse every time this team takes the ice. Yes, the RedHawks still have 14 freshmen on their roster, but they’ve been playing competitive games for two months now and most of these guys come in at 19, 20 or 21 now. We’ll say it again: Having a young team means so much less in hockey than it does in the Big Two. There’s the older player factor (only Willie Knierim is a true freshman) and these guys play 70-game seasons in juniors prior to college. Of the previous eight seasons, Miami has advanced in the NCAA Tournament three times. Twice it has been during the freshman-heavy recruiting campaign. The other was 2009-10, a team with eight sophomores and only four seniors, went to the Frozen Four. That’s not to say this team won’t get better as the season progresses. But there’s no excuse for any team to squander multiple multiple-goal leads late. The RedHawks play 34 regular season games. This was Game 14, with Game 15 set for Saturday night. 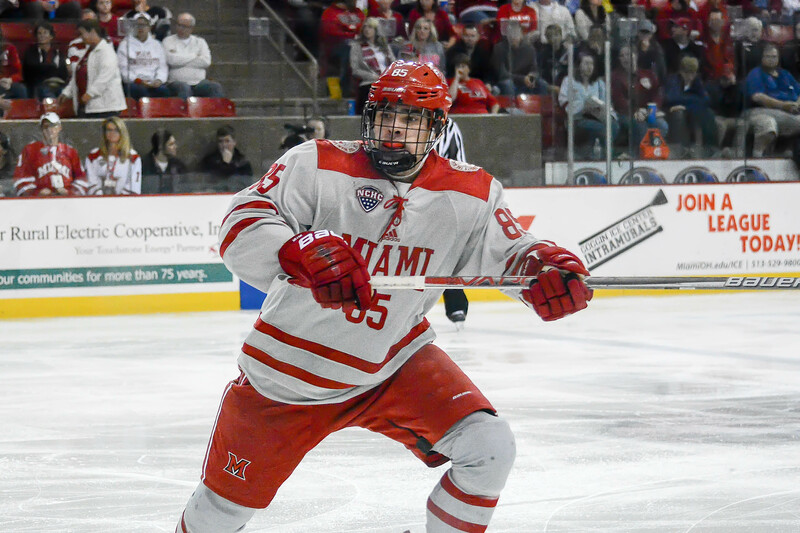 Miami returns home to host Colorado College for a pair, which will take the team to the midway point of its schedule. Granted, four ties essentially equals two wins, but the RedHawks need to string together some W’s quickly or they could be looking at another short postseason and long off-season. – First a couple of positives. Carson Meyer returned after missing four straight games, and he scored Miami’s first goal. In 10 games he has three markers and eight assists for a freshman-best 11 points. 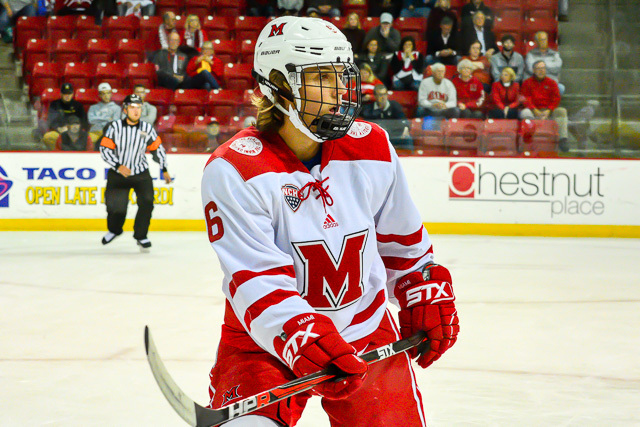 – Captain Louie Belpedio also was back in the RedHawks’ lineup, having sat the last six with a lower body injury. Miami was outshot in every game he was out – 220-151 in those contests – and the RedHawks actually led, 31-25 in SOG on Friday. On the flip side, he took three penalties down the stretch and Cornell scored Goal No. 4 on the second minor. – Goals: Other than Meyer, Grant Hutton scored his fourth of the season after posting no goals and five assists in 2015-16. Also, freshman Karch Bachman recorded the first of his college career. This pair led the team in shots: Bachman finished with six and Hutton – a defensive defenseman – ended the night with five. – Miami was only on the power play twice on Friday while Cornell (6-3-1) had six chances on the man-advantage. That differential of minus-4 opportunities was a season low for the RedHawks. MU was outscored, 1-0 on the man-advantage and obviously lost by one goal overall. – Talk about a slick highlights reel: Check out the one the Big Red put together for Friday’s game. Or, considering the outcome, maybe just watch the first half.